Description: The Twinkle Star Ball is sure to get the attention of babies. The ball has brightly colored divider wall creating 4 different "rooms" inside. The ball has rolling beads inside to catch infant's eye and challenge curiosity. Designed for children ages 6 to 36 months old. 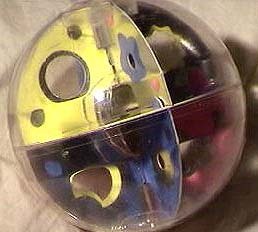 FPT19019 - Clear plastic ball with bright colored dividers walls inside that creates 4 different rooms inside. The divider walls are decorated with yellow and metallic silver stars and designs. The walls have different shapes holes in them to allow the trapped beads inside the ball to pass from "room" to "room". The ball is marked with a "Fisher-Price" imprint on the outside edge. Measures 5 inches diameter. This ball was sold in a 5-1/8" long, 8-1/16" high, 5-1/8" deep display box.